Periodically, Asheville Tea Party has been taking pictures of the non-compliant 'No Weapons' signs in parks since the new gun law was passed in 2013 that allows conceal carry permit holders to carry in parks. It appears that old 'No Weapons' signs have not been taken down.. Grassroots North Carolina is helping us come to a resolution of the situation of the city's non-compliance. See President Paul Valone's letter below dated February 10, 2016. The City has ten days to reply. Asheville Tea Party was also mentioned in a news piece in the Raleigh News Observer a few days ago (February 11th) regarding gun raffles (that we have had quite a few.) Surprised they didn't mention the three machine gun socials we've also had! Stay fine tuned for further developments! Please be advised that the City of Asheville has posted its parks and recreational facilities against lawful carry of concealed handguns in violation of N.C.G.S. § 14–415.23. On December 1, 2011, Section 21(b) of Session Law 2011-268 (formerly House Bill 650), became effective, amending N.C. Gen Stats. § 14-415.23 to restrict the areas in which units of local government may prohibit handguns carried in compliance with Article 54B of the North Carolina General Statutes. Specifically, local governments may no longer prohibit concealed handguns in parks, except in “recreational facilities that are specifically identified” by ordinance. Although Appendix G purports to list all of the recreational facilities in which firearms are banned, entire parks not listed in Appendix G are also posted. For example, please see the attached photo of French Broad River Park, which contains only a walking trail and specifically may not be posted against concealed carry under N.C.G.S. § 14–415.23. Regardless of whether a park contains a “recreational facility” as defined by North Carolina statutes, entire parks have been posted instead of just the recreational facilities within those parks. As an example, please see the attached photo from Carrier Park. Although required by North Carolina statutes, neither Asheville’s ordinance nor its signage limits prohibitions against concealed handguns at “athletic fields” to periods of time during which organized athletic events are scheduled. Accordingly, if the City of Asheville fails to revise its ordinance to comply with state law, our non-profit sister organization, Rights Watch International, will recruit plaintiffs from Asheville (where we have had a large number of volunteers) to pursue litigation against the City for declaratory and injunctive relief, and seek damages plus the recovery of attorney’s fees and court costs. The only question is whether the City will amend its ordinances to conform to § 14-415.23, or whether a court will order it to do so after costly and distracting litigation. Please advise me, within ten (10) business days, of which course the City chooses. Good afternoon from Capitol Hill, where conservative lawmakers say that improving mental health care is a better way to curb gun crime than President Obama's executive actions to restrict gun ownership. Among those making the case are Maryland's only Republican congressman and an Alabama lawmaker who lost his grandfather to a mentally ill gunman. Also today: the commonsense argument for taking food stamps out of the farm bill. A House Republican says background checks for guns "don't solve the problem." Rep. Andy Harris, R-Md., faulted the president for making a "straw man" attempt to unilaterally expand federal background checks in gun sales through heightened firearm licensing requirements and more FBI staff to process applications. The fatal shooting of this congressman's grandfather prompted him to urge mental health reform, not gun control. “I take every incident of gun violence seriously,” Rep. Bradley Byrne, R-Ala., said Wednesday on C-SPAN. "What the president proposed yesterday will not affect this problem at all." Congress can take an important step in 2016 to address the 'food stamp' bill. The next farm bill won't be considered until at least 2018. However, Congress can take what should be non-controversial action now that sets up the possibility for real reform in the future: Separate agricultural programs from the food stamp program. What we're reading: Arizona Gov. Doug Ducey appointed Clint Bolick to the state's Supreme Court this week. While conservatives are cheering the Institute for Justice founder’s new role, liberals declared it “the most chilling political appointment that you’ve probably never heard of.” Bolick is the former president of the Alliance for School Choice and most recently led the litigation team at the Goldwater Institute. Steven Hayward of Power Line explains why liberals should be worried. The House passed a reconciliation bill Wednesday that repeals parts of Obamacare and puts a one-year moratorium on federal funding for Planned Parenthood. The legislation now heads to the White House, where the president will veto it. 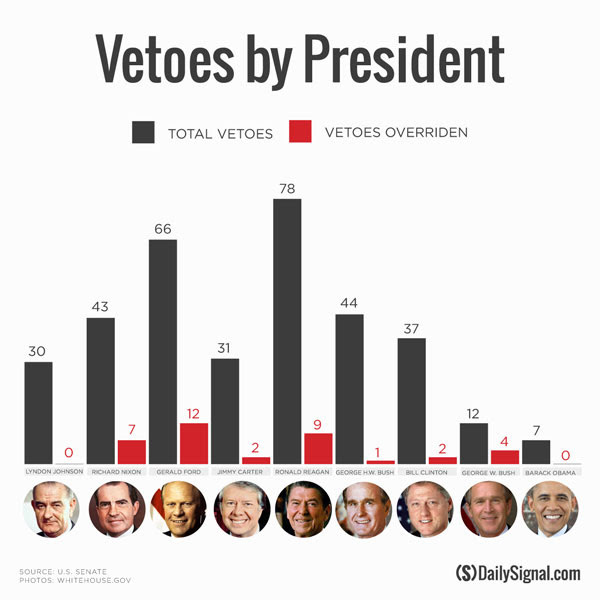 Republicans lack the votes to override President Obama's veto, keeping intact his perfect record on vetoes. The Daily Signal's Melissa Quinn has more on yesterday's vote. The Los Angeles Times recently reported that the Obama Administration is planning to: "ban Social Security beneficiaries from owning guns" if they lack the capacity to "manage their own affairs." This move would likely affect millions of senior citizens. These vulnerable Americans, who pose no threat to anyone, would be effectively stripped of their 2nd Amendment rights simply because they lack the ability to balance a checkbook. "Someone can be incapable of managing their funds but not be dangerous, violent or unsafe," said Dr. Marc Rosen, a Yale psychiatrist who has studied how veterans with mental health problems manage their money. "They are very different determinations." Someone who is incapable of managing his own funds is not dangerous, violent or unsafe. Vulnerable seniors should not be left defenseless by having their 2nd Amendment Rights taken away through backdoor gun legislation. You have a duty to stop this. So please offer or support an amendment to the appropriations bill that funds Social Security (H.R. 3020 and S. 1695) that will eliminate funding for this gun ban.